On September 30, 2016, Rosetta concluded its mission by crash-landing on Comet 67P/Churyumov-Gerasimenko (67P for short). The probe studied the comet for over two years, up to its final moments, and since then researchers, with the help of citizen scientists, have released incredible images of 67P. The latest one delivers another breathtaking view that truly makes you feel like you are on the comet. The image is actually one of the first snaps taken of 67P. The region was photographed on September 22, 2014, just a month and a half after the European Space Agency probe began orbiting the comet. The image was selected and processed by citizen scientist Jacint Roger Perez from Spain using three images from the spacecraft's OSIRIS camera. 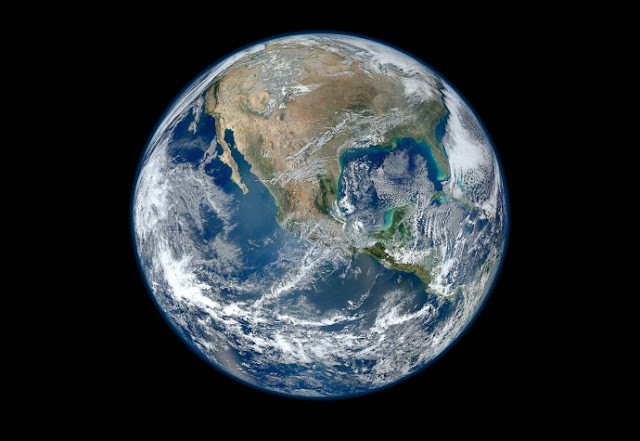 In the foreground of the image, we see the region known as Seth, one of the 26 distinct regions named after Egyptian deities. It is located on the larger of the comet’s two lobes and is full of pitted and brittle material. 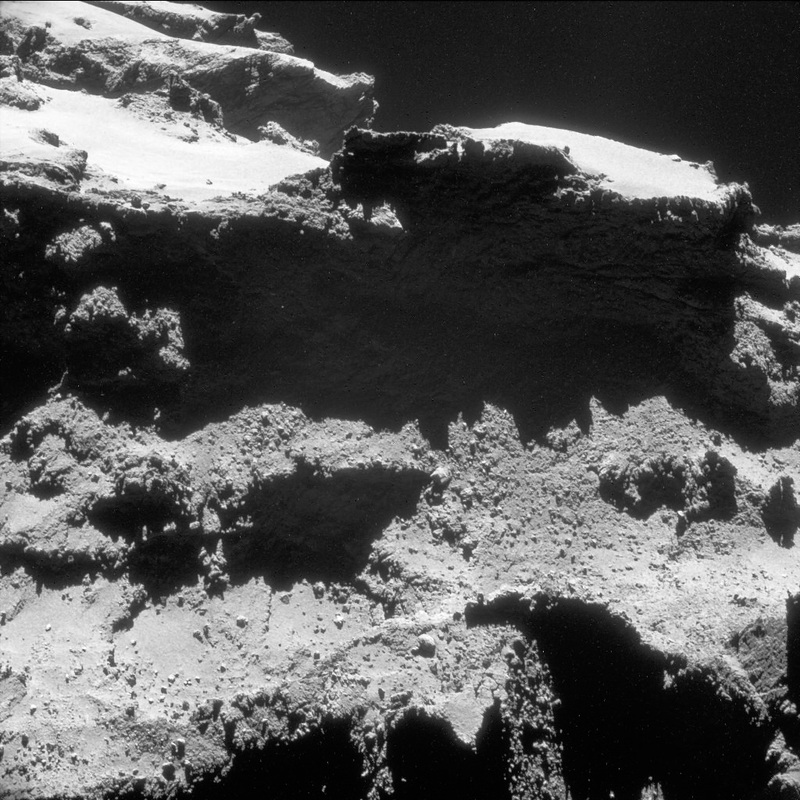 Seth gently declines towards the much smoother Hapi region on the 'neck' of the comet. The background of the image shows the Babi and Aker regions and right at the bottom, there’s the Aswan cliff, a 134-meter-high (439-foot) precipice separating the Seth and Hapi regions. Subsequent observation in August 2015 revealed that part of the cliff had collapsed as the comet was getting near its perihelion, the point in its six-year orbit where it's closest to the Sun. During this time, activity on the surface of the comet spikes, which can alter the tiny world's terrain significantly. Despite the close-up view of the image, Rosetta was roughly 28.2 kilometers (17.5 miles) from the surface when it was taken. 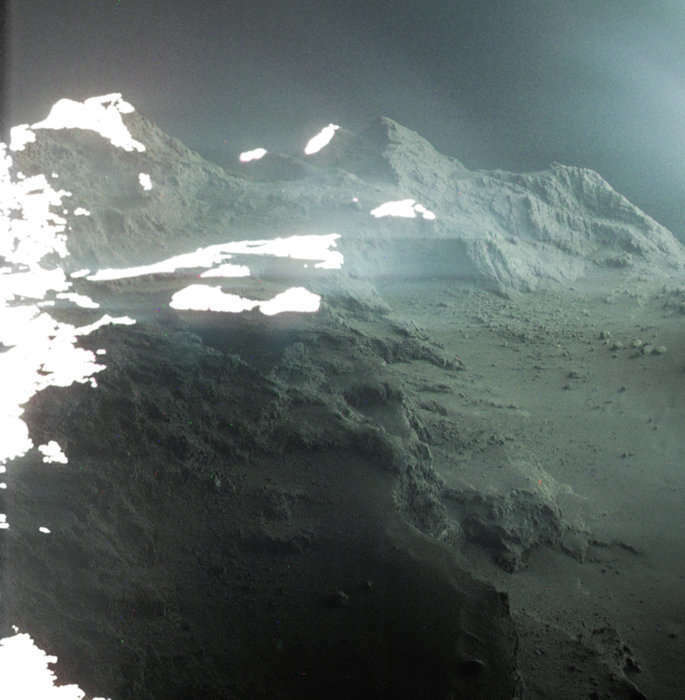 At that altitude, Rosetta was able to image and study the comet in outstanding detail. The 11 scientific instruments that make up its arsenal were used to scan the comet's surface, probe underneath it, and study the dust, gas, and plasma surrounding it. Rosetta delivered a small lander to 67P, called Philae, the first human-made object to land on a comet. The mission has been one of the most successful in the history of space exploration and has significantly expanded our understanding of cometary bodies in the Solar System.